Naresh Miryala's Oracle DBA Blog: Forms Servlet or Socket Mode - Which is better ? Forms Servlet or Socket Mode - Which is better ? Many products within the Oracle E-Business Suite have screens that are built with Oracle Forms. Oracle Forms can be run in either servlet mode or socket mode. Apps 11i is based on Forms 6i and is configured to run in socket mode by default. Apps 12 is based on Forms 10g and is configured to run in servlet mode by default. What are these modes, and which is better? What is Forms Servlet Mode? 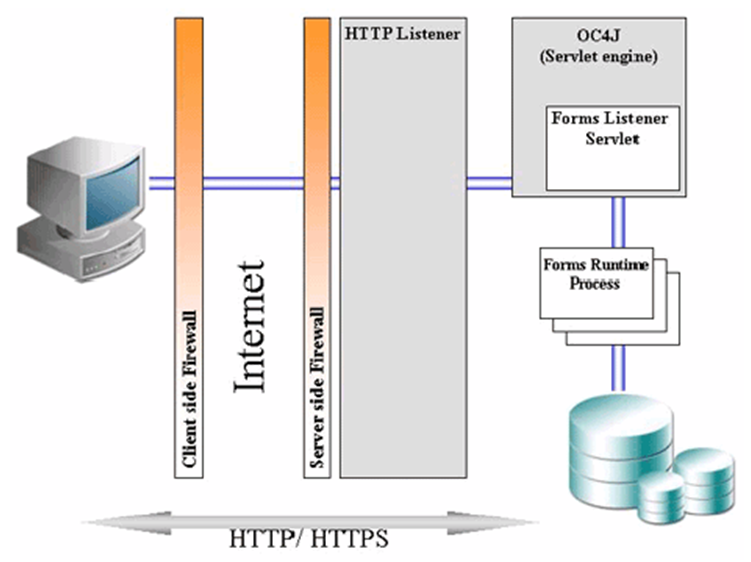 The Forms Listener Servlet is a Java servlet that delivers the ability to run Oracle Forms applications over HTTP and HTTPS connections. It manages the creation of a Forms Server Runtime process for each client, as well as network communications between the client and its associated Forms Server Runtime process. The desktop client sends HTTP requests and receives HTTP responses from the web server. The HTTP Listener on the web server acts as the network endpoint for the client, keeping other servers and ports from being exposed at the firewall. What is Forms Socket Mode? Initial releases of the Oracle Forms Server product used a simple method for connecting the client to the server. The connection from the desktop client to the Forms Listener process was accomplished using a direct socket connection. The direct socket connection mode was suitable for companies providing thin client access to Forms applications within their corporate local area networks. For the direct socket connection mode, the client had to be able to see the server and had to have permission to establish a direct network connection. Although the direct socket connection mode is perfectly suited for deployments within a company’s internal network, it's not the best choice for application deployment via unsecured network paths via the Internet. A company connected to the Internet typically employs a strict policy defining the types of network connections that can be made by Internet clients to secure corporate networks. Permitting a direct socket connection from an external client exposes the company to potential risk because the true identity of the client can be hard to determine. 1. HTTP and HTTPS traffic is easily recognizable by routers, while socket mode communications is generally considered suspect and treated on an exception basis. 2. Existing networking hardware can be used to support basic functions such as load-balancing and packet encryption for network transit. 3. More resilient to network and firewall reconfigurations. 4. More robust: servlet connections can be reestablished if network connections drop unexpectedly for Forms, Framework, and JSP-based pages. 5. Is the only supported method for generic Oracle Forms customers, and therefore is more thoroughly tested by the Forms and E-Business Suite product groups. 6. Performance traffic can be monitored via tools like Oracle Real User Experience Insight (RUEI). 7. Socket mode is not supported on Windows-based server platforms. 1. Uses up to 40% less bandwidth than Forms servlet mode. This may be perceived by Wide Area Network (WAN) users as causing slower responsiveness, depending upon network latency. 2. Uses fewer application-tier JVM resources than servlet mode, due to fewer TCP turns and lack of overhead associated with HTTP POST handling. Due to its numerous advantages, Forms servlet mode is the preferred and recommended deployment model for Forms on the web. There may be circumstances where you need to switch between the default Forms modes. You might wish to switch your Oracle E-Business Suite Release 12 environment to socket mode to improve performance or reduce network load. You might wish to switch your Apps 11i environment to servlet mode as part of your rollout to external web-based end-users outside of your organization.